It is definitely the heart of winter, mid-February, and we would be lucky if we had a week that didn’t have frigid temperatures, snowfall and blizzard-type winds, and long nights. Compared to the spring and summer seasons, winter in the northeastern hemisphere of the United States challenge even the happiest of people — weather conditions force us to stay indoors as much as possible, unless we emancipate ourselves from the city during these times into a cabin in the woods with hot cocoa and recreational activities meant for the season. I am willing to bet however we aren’t all as lucky; city life and the responsibilities that come with it keep us close to it even in the harshest winter weather conditions. Compound that feeling of being trapped with heavy layered clothing, dangerous walking and commuting conditions, and gray, dreary short days that at 5 pm remind you it is wintertime with it’s pitch black quick nightfall. Understandably this time of year, after the holidays have passed, depression sets in full force. There are those of us, however, who suffer a more consistent, cyclical type of depression this time of year called Season Affective Disorder or SAD. SAD has been recognized and included in the diagnostic classification system of the Diagnostic and Statistical Manual for Mental Disorders, Fourth Edition as major depressive disorder with seasonal pattern. In most cases, seasonal affective disorder symptoms appear during late fall or early winter and go away during the sunnier days of spring and summer. However, for those people with the opposite pattern, meaning have symptoms that begin in spring or summer may be suffering from a major depressive disorder. 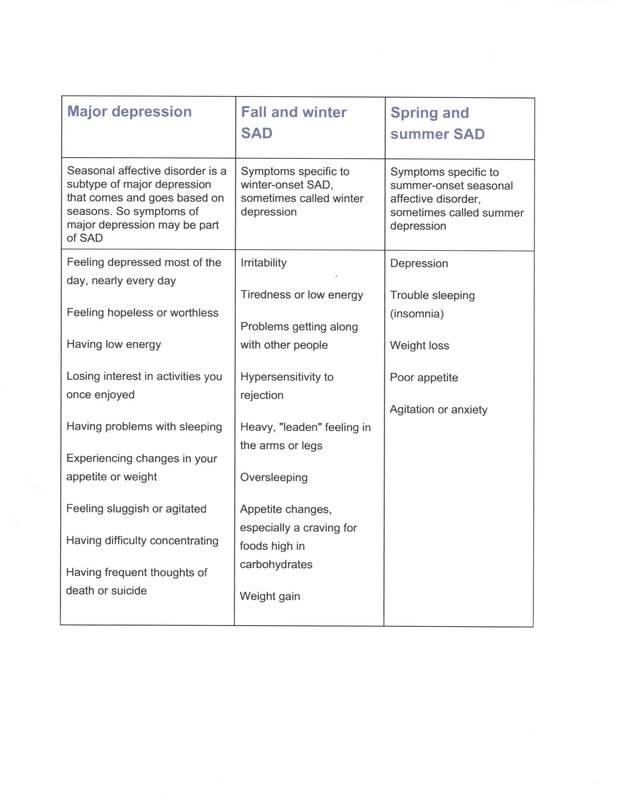 There is a clear difference identified between Major Depression affected by SAD, Fall and Winter SAD stand alone, and then a category that actually has a Spring and Summer SAD! Obviously, the most popular kind is in the fall and winter, however there are those who have difficulties thriving in the Spring and Summer and display the symptoms listed above. After serving a distinguished career at the National Institute of Mental Health researching cyclical mood patterns, Norman E. Rosenthal, MD, currently a Clinical Professor of Psychiatry at Georgetown University Medical School and Medical Director of the Capital Clinical Research Associates, in Rockville, Maryland, sheds light on the topic in an interview with Psychiatry (As published in NICH website). He also says that SAD in its full form affects productivity in work or school, affect interpersonal relationships, and causes a marked loss of interest or pleasure in most activities. There is a milder form of seasonal disorder which is called the winter blues and yields similar symptoms of decreased energy and increased appetite. This can also affect enthusiasm and productivity. For instance, people with SAD report sleeping an average of 2.5 hours more in winter than in the summer, whereas people with winter blues sleep 1.7 hours more (the general population sleeps 0.7 hours more in the winter). So how do we combat depression, SAD or otherwise? Typical Major Depression that is not directly affected by SAD are affected by Dopamine and Serotonin levels. A Study in the International Journal of Neuroscience in 2005 by TIFFANY FIELD, MARIA HERNANDEZ-REIF, MIGUEL DIEGO, SAUL SCHANBERG, and CYNTHIA KUHN determined that in studies cortisol was assayed either in saliva or in urine, significant decreases were noted in cortisol levels (averaging decreases 31%). In studies in which the activating neurotransmitters (serotonin and dopamine) were assayed in urine, an average increase of 28% was noted for serotonin and an average increase of 31% was noted for dopamine. These studies combined suggest the stress-alleviating effects (decreased cortisol) and the activating effects (increased serotonin and dopamine) of massage therapy on a variety of medical conditions and stressful experiences. They suggest that massage therapy improves overall wellness that can be utilized as an external source of increasing the happy neurotransmitters. 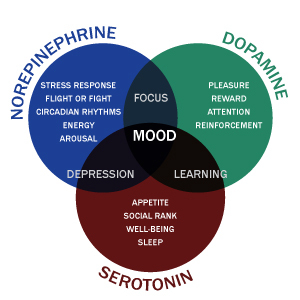 The three neurotransmitters combine to maintain mood, focus and learning. Interestingly enough however, the serotonin-norepinephrine connection is what mostly determines the increase in depression, while dopamine-serotonin here is claimed to be highly involved in learning. Would it be safe to say then if the focus was on new learning and equipping one with new skills, that this may also offset major depression with chemical intervention to stabilize the serotonin-norepinephrine channels? New learning has been related to initially boosting dopamine which attracts wellness and confidence, and in turn effects the serotonin levels and pulls away from the norepinephrine pull to depression. However, learning something new is only a small part of the solution. There are many more complex factors in major depression such as genetics, environmental situations, lifestyle choices which includes work-rest-exercise balance, diet and sleep. For those with SAD on either the Fall-Winter Seasons or the Spring-Summer Seasons, Dr. Rosenthal says commonly used therapies include Light therapy, psychotherapy, and medications are the main treatments for SAD. Also, stress management and exercise programs can be helpful. Although the first controlled studies of light therapy were conducted only 25 years ago, this treatment has subsequently become the mainstay of SAD therapy throughout the world. Mayo clinic also indicates that one’s biological clock (circadian rhythm) is part of what is affected by SAD sufferers. The reduced level of sunlight in fall and winter may cause winter-onset SAD.The changes in the season can disrupt the balance of the body’s level of melatonin, which plays a role in sleep patterns and mood. Reduced sunlight can cause a drop in serotonin that may trigger depression. In the New York Times article by Roni Rabin in 2011, “A Portable Glow to Help Those Winter Blues,” it quotes a 2006 multicenter double-blind randomized controlled trial that compared bright-light therapy head to head with the popular antidepressant Prozac (fluoxetine) in 96 subjects found the two treatments equally effective for alleviating winter depression, though light produced results faster, usually within a week, and with fewer side effects. Presently, popular companies like Verilux, Nature Bright, and Northern Light Technologies have come up with consumer based light boxes that can be used all year round at home and in other locations with lack of light. Dr. Andrew Weil, a doctor and author who focuses on holistic health recommends SAD sufferers must sit in front of the light for about a half an hour per day. Light therapy is reputed to work in 80 percent of all cases of SAD. This treatment can relieve symptoms within a few days, but sometimes takes as long as two weeks or more. He cautions that while light boxes can be purchased without a prescription, a physician or other mental health professional can provide guidelines as to how to use a light therapy box for maximum effectiveness and may recommend a particular light box (you may need a doctor’s prescription if you’re seeking insurance coverage for the cost of a light therapy box). Exposure to natural sunlight as well during the long winter months is recommended as well as a walk outside during the morning hours, however that is dependent on lifestyle and weather conditions unfortunately. The bottomline is this: whether it is major depression or SAD that causes you to be frozen in your own life, aiming for the serotonin-dopamine increase will ultimately be the key to off-setting the symptoms and hopefully improve the quality of living in the long run. Thanks for sharing information from the Mayo Clinic in this post. The steps we take to combat depression and SAD are definitely critical in improving our quality of living. Thank you for your comment! We are glad that you were able to find the information helpful. Quality of life indeed is important at the end of the day, and the more empowering the information, the better the chances of gaining momentum to improvement. Thanks again!